Project Loon began rolling out internet to the island in late October. In late October, Project Loon began transmitting internet to Puerto Rico by way of giant balloons. Now, the company behind the initiative says it's provided 100,000 people on the island with service. Project Loon, a balloon-powered internet program from Alphabet's X, partnered with AT&T and T-Mobile to transmit internet to people in need on the island. That number is pretty impressive — this is only the project's second major roll out, and the company says it was able to get it off the ground faster than its previous project. Still, a lot of the U.S. territory's 3.5 million people are without internet and cell services after Hurricane Maria knocked out much of Puerto Rico's infrastructure. On Thursday, the Federal Communications Commission said about 44 percent of cell sites were still out of service on the island. More than half of the island's counties are missing more than half of their cell sites. There's also the issue of power. 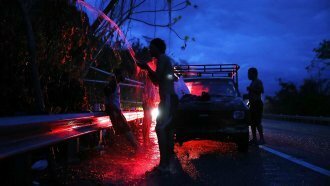 The island is still facing a major power shortage, making the question of internet connectivity in many places moot.